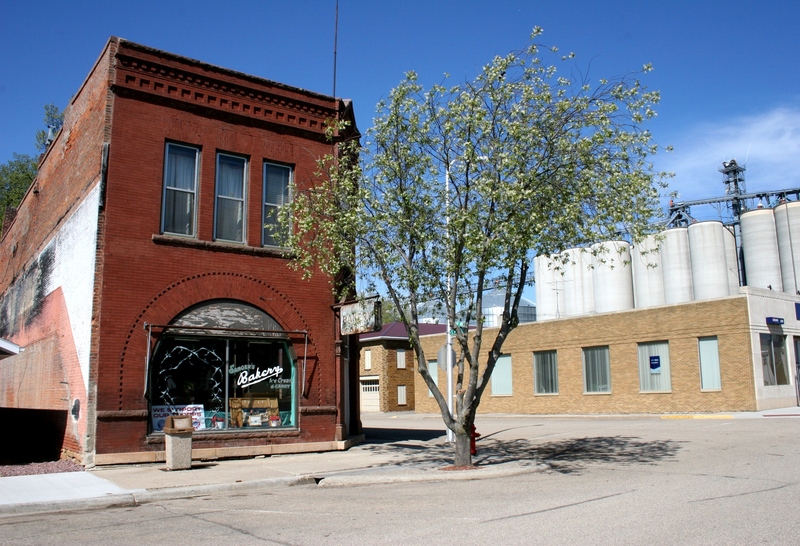 The former Sanger’s Bakery in Lamberton, a Minnesota farming community. I’d move the garbage bin in front of the building, replace it with a bench and add pots of vivid flowers. I’VE PHOTOGRAPHED many an old building in a lot of small towns. My appreciation for history and architecture and for rural life keep drawing me back to Main Street. One building in particular intrigues me. 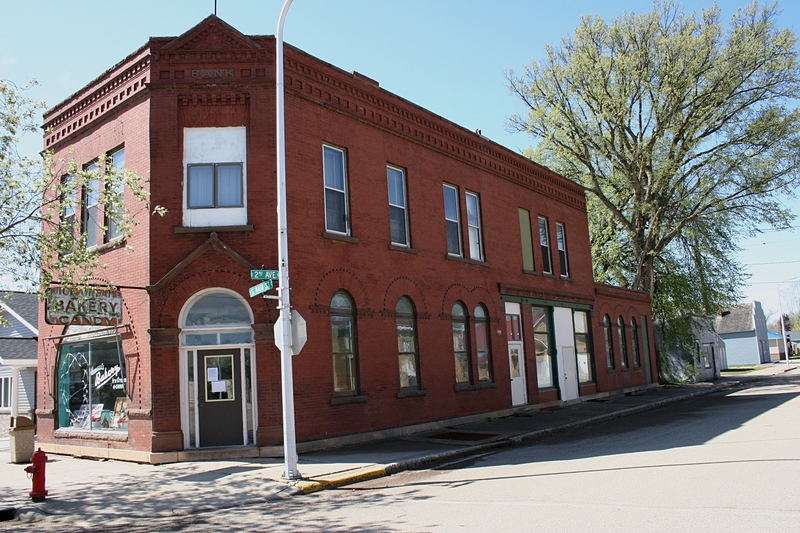 The former Sanger’s Bakery, a brick stronghold anchoring a corner in downtown Lamberton in southern Redwood County, possesses a sweet, timeless charm that causes it to stand out. 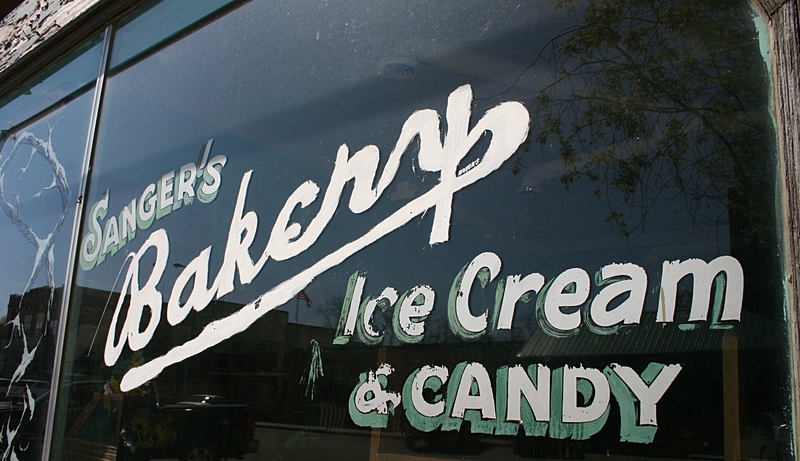 How long has this signage been painted on the front window of Sanger’s? It’s not necessarily the exterior that catches my eye, although certainly the signage and sweeping arched front window and the fancy details in the brick appeal to me. Rather, it’s the interior which truly captures my interest. The two times I’ve photographed the exterior, I’ve also paused to press my nose against the windows and peer inside to a snapshot of the past. You would swear the hands on the vintage 7-UP clock have not moved in decades. An old-fashioned candy counter and vintage lunch counter rimmed with stools look like something straight out of a Norman Rockwell painting. A vintage sign suspended from the front of the bakery. Honestly, you just don’t find places like this anymore. Martin Kuhar opened the bakery in 1928. The Sanger family purchased it in 1946 and eventually Bob, the youngest of Nick and Mary’s six children, bought the business in 1961. He was a 1955 graduate of the baking program at Dunwoody Institute. All of this I learned on a recent stop at the bakery, where I found Bob’s obituary taped to the front door. He died March 30. Just days before his death, this long-time baker was serving coffee to his friends. Oh, how I wish I could have been in that coffee klatch, listening to the stories. I bet Bob would have shared plenty about the place where he served up baked goods, hand-scooped ice cream cones, malts and candy. He baked buns for local schools and churches and crafted wedding cakes. He also sold fresh eggs from his chickens and honey from his bees. He tended a garden. After reading Bob’s obit, I desired even more to get into the bakery. I jiggled the front door knob, hoping the door might be unlocked. It wasn’t. I’m determined, on my next trip to Lamberton, to get inside the bakery, to share with you this treasure from the past. In the meantime, owners of this building and Lamberton area residents, I hope you appreciate what you have here. I could easily see this former bakery reopened as an ice cream/sandwich/pie/coffee/gift shop. The location along U.S. Highway 14 only 10 miles from Walnut Grove, childhood home of author Laura Ingalls Wilder, is ideal. 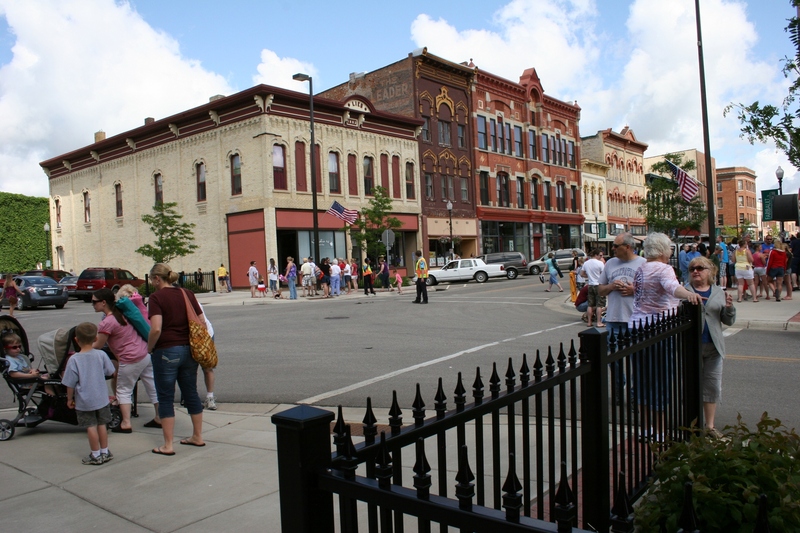 The area already draws plenty of tourists during the summer months. 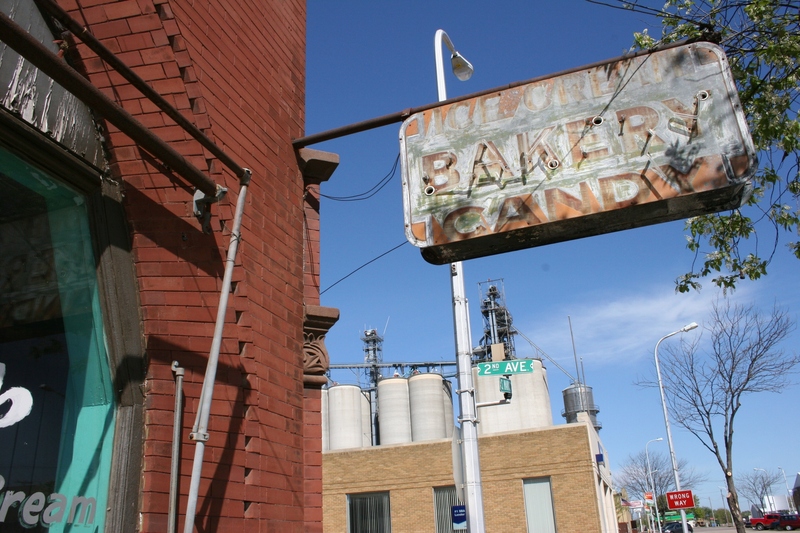 The right owner, with the right ideas, a good business and marketing plan, and adept at using social media could turn this old bakery into a destination. I can envision the possibilities. Readers, what do you think? If anyone out there knows anything about plans for the old bakery, submit a comment. Or, if you simply have ideas, I’d like to hear those, too. A side shot of the former bakery. Just imagine the possibilities for this spacious building. Let’s hear your ideas. I’M GOING TO HAVE a proud mama moment today. So please indulge me. But my youngest, my only son, graduates in a few days and I am especially proud of his academic accomplishments. Last Thursday my husband and I attended Senior Awards Night at Faribault High School where graduating honor students were recognized and scholarships awarded. Although the guidance office had notified me that Caleb was receiving a scholarship, I didn’t know specifics. Reading through the list of scholarships on the printed program, I couldn’t figure out which one he was getting. But when Cheryl J. Freund, former school district curriculum director, explained the selection process behind awarding of the $1,000 Faribault Falcon Scholarship Fund Scholarships, I knew. The scholarship recipients, she said, were chosen based on ACT test scores and grade point averages. It mattered not whether you played sports, served your community, participated in theater or anything. The scholarship was solely, unequivocally, for academic achievement. Thank you, Faribault Falcon Scholarship Fund committee for that sole focus on ACT scores and GPAs. Thank you. Caleb performed exceptionally well on his college entrance exam and has a near 4.0 GPA. Now I’d like to take some genetic credit for my son’s intelligence. But since he excels in mathematics and science (my weaknesses) and has to work a bit harder at English (my strength), I cannot claim credit for his academic success. I’ve never been the type of parent to check his homework or read his papers or such—except encourage him and bug him about completing assignments. I’m just not that kind of hands-on homework helping parent. Like he ever needed my help anyway. I suppose, though, that the emphasis I placed on reading through-out Caleb’s formative years and even today, did factor into his success in school. My teen is a voracious reader—for the enjoyment of reading and for the purpose of learning. He has taught himself so much by reading on his own, not because I told him to read or because he was assigned reading for a class, but because he wanted to learn more. My son’s also had some engaging and encouraging teachers in the past few years as he’s taken a rigorous course of advanced and college level classes in subjects like physics, calculus, composition, chemistry, anatomy and physiology, and more. I expect Caleb will have nearly a year of college credits when he begins classes later this summer at North Dakota State University. Just last Friday he took a College-Level Examination Program test in chemistry for which he’ll receive four college credits. He was the only student taking the test at Minnesota State University, Mankato, and only the second student to have taken the CLEP chemistry exam there, according to the examiner. 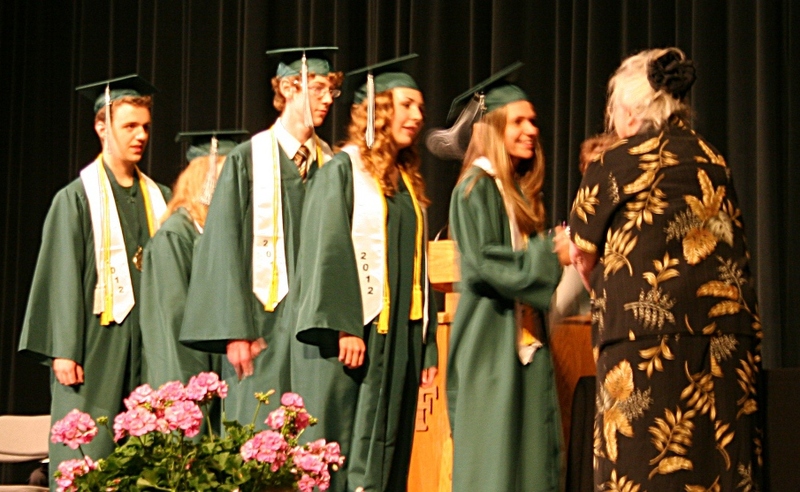 Caleb’s academic achievements and self-initiated pursuits in computer technology also earned him a Presidential Scholarship, an Entrepreneurial Scholarship and entrance to the Honors Program at NDSU. About a third of his college costs will be covered by scholarships. As part of the Entrepreneurial Scholarship, he will work and volunteer in the university’s technology incubator. What an incredible opportunity to learn and to network. In 2 ½ months, my 18-year-old leaves home to further his education, working toward a degree in computer or electrical engineering. I have no doubt Caleb will continue to approach education as he always has, with enthusiasm and with a strong desire to learn. 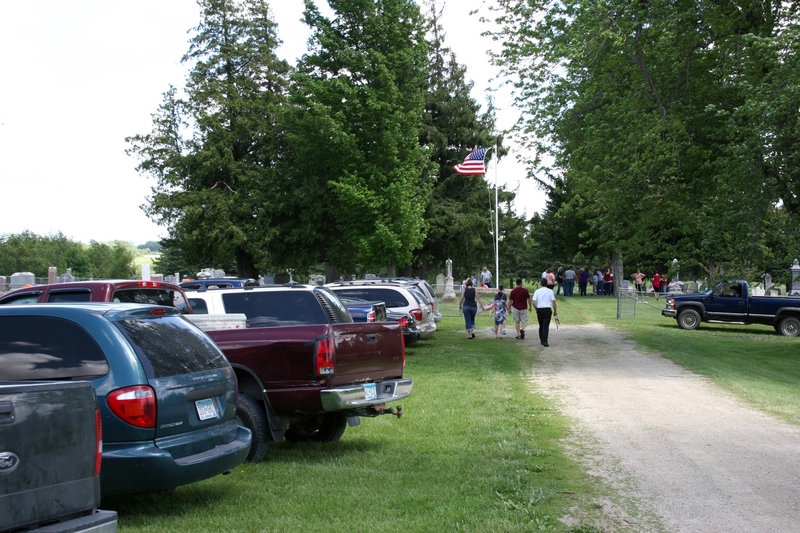 Walking into the Cannon City Cemetery for a Memorial Day program. 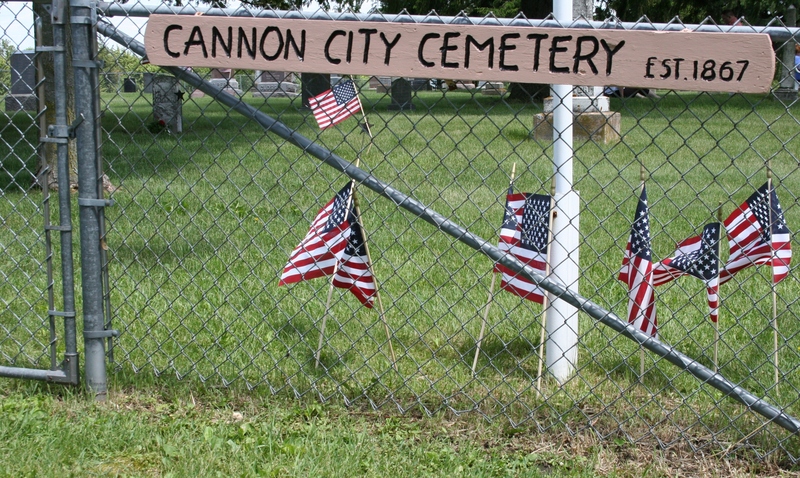 CANNON CITY on Memorial Day is about as grassroots Americana as you’ll get. 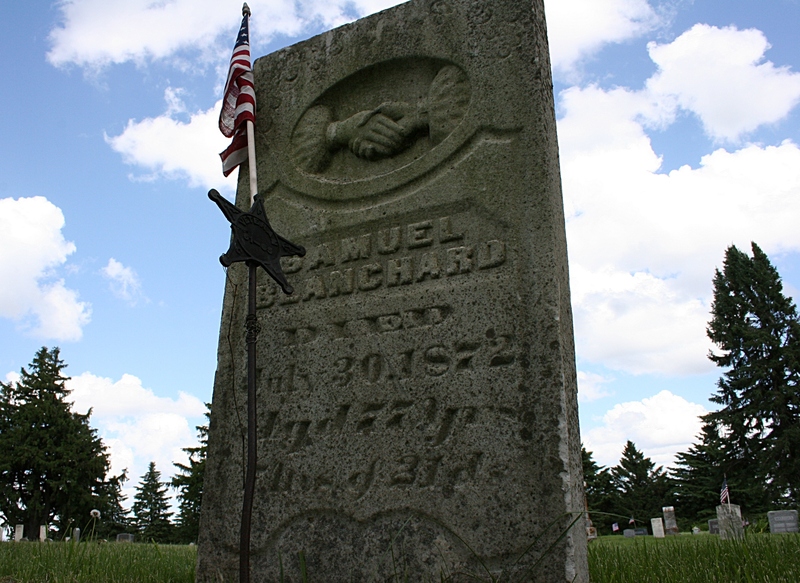 While a Death March and marching students and lilac wreaths and a school picnic are no longer a part of the observance, it remains firmly patriotic, firmly established as a tradition in unincorporated Cannon City near Faribault. I came here with my husband on Monday because we’d come here last Memorial Day and were so impressed and moved by the experience that we wanted to attend again. A snippet of those gathered for Monday’s program, including Jean Pederson, seated left, who recited “In Flanders Fields,” and others who led the program. 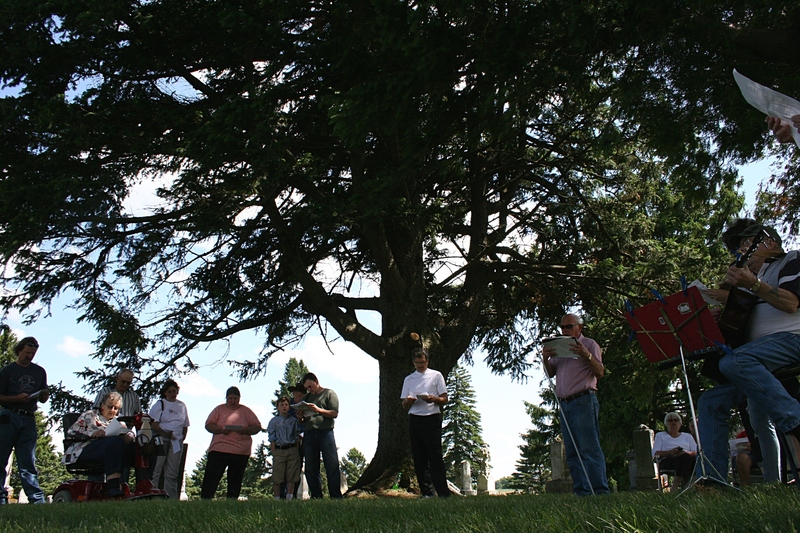 It is the simple, unpretentious, down-to-earth patriotic feel of this under-the-trees, between-the-tombstones, informal program that appeals to me. Don Chester sets up his guitar and music before the program. 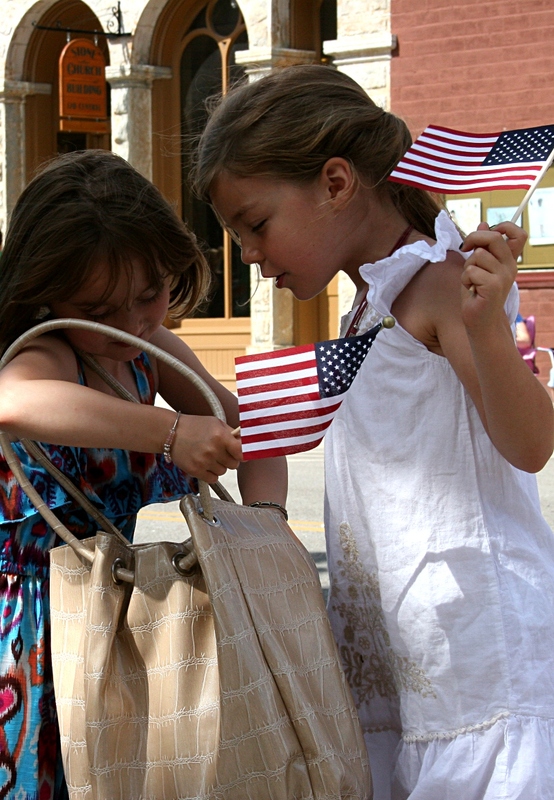 All eyes are on the American flag. 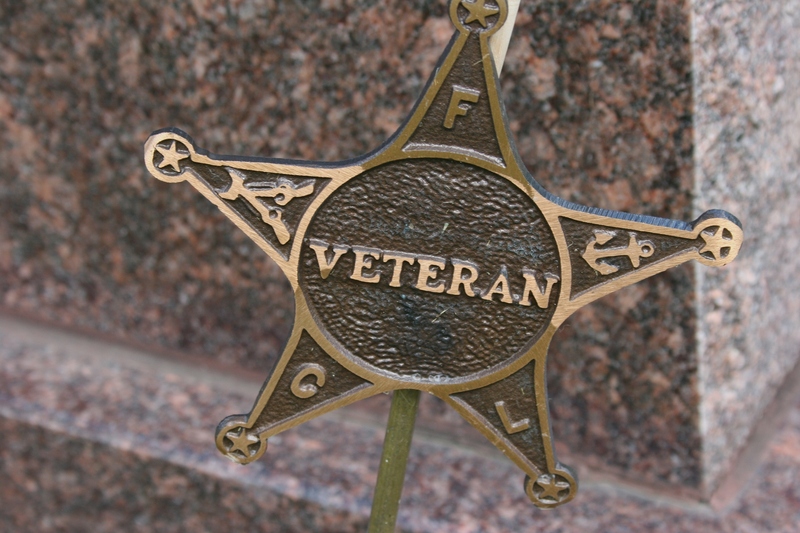 A star marks a veteran’s grave. 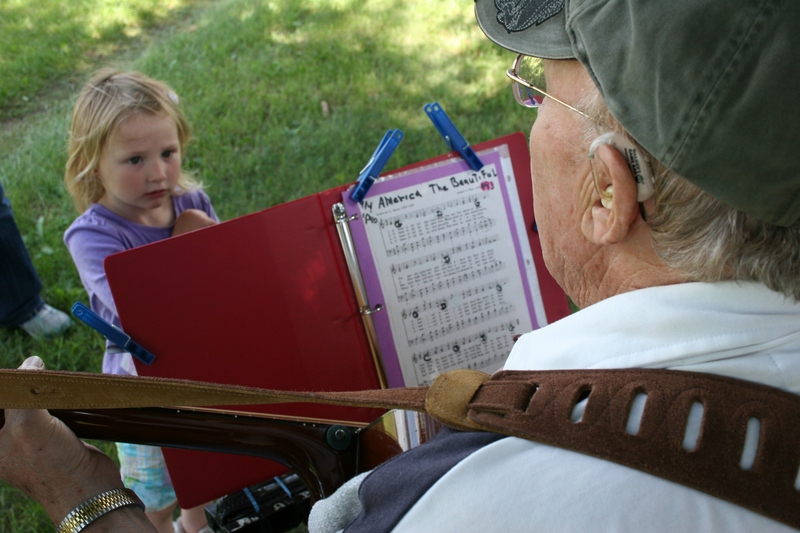 Kathleen Kanne plays a soulful song by J.S. Bach. 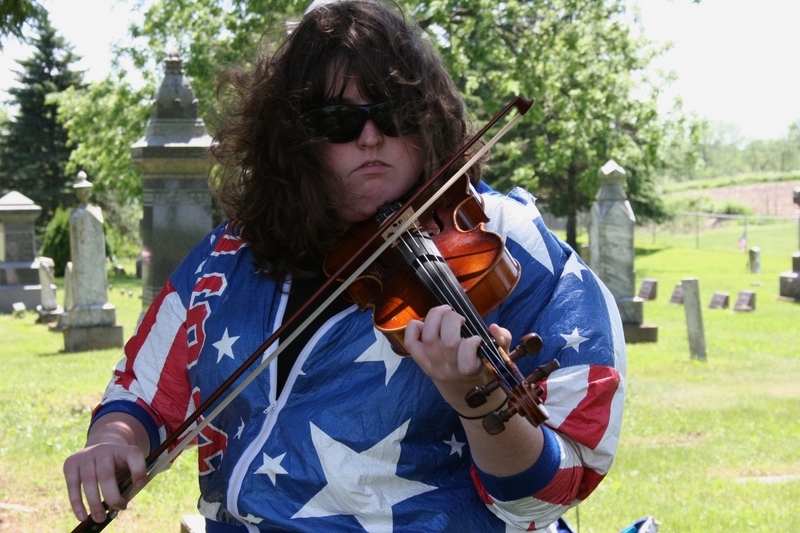 You cannot help but sense the spirits of the dead as 18-year-old Kathleen Kanne slides a bow across her violin in a soul-touching rendition of “Gavotte in G Minor” by J.S. Bach. 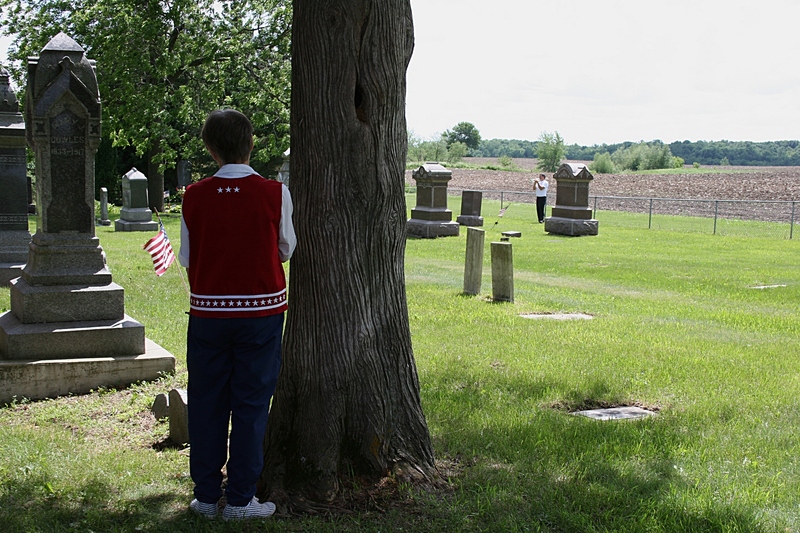 And later, when you talk to this college freshman, you admire her determination to become more involved with the cemetery association after attending the Memorial Day service for the first time in 2011. She was visiting her father’s grave then—he died unexpectedly at age 58—and was impressed enough by the program to return and participate. One of many soldiers’ graves in this cemetery. Twenty-two Civil War soldiers are buried here. Steve Bonde, right in the distance, plays the taps. Then, as Steve Bonde, stands at the edge of the cemetery next to a tilled field and closes the program with the mournful sounding of taps, you cannot help but feel a deep sense of grief rush over you in remembrance of all who sacrificed themselves for their country, for freedom. 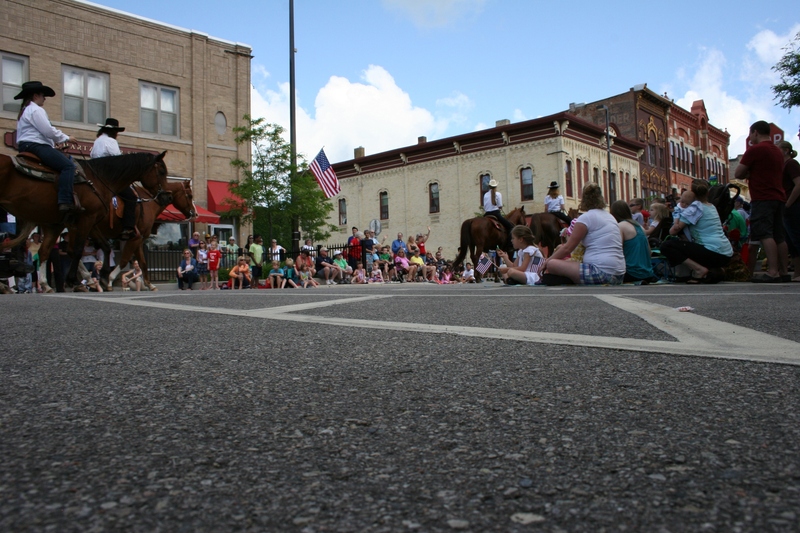 The annual Memorial Day parade proceeds along Central Avenue in historic downtown Faribault. MY HUSBAND AND I TOOK in the annual Memorial Day parade in Faribault this morning. 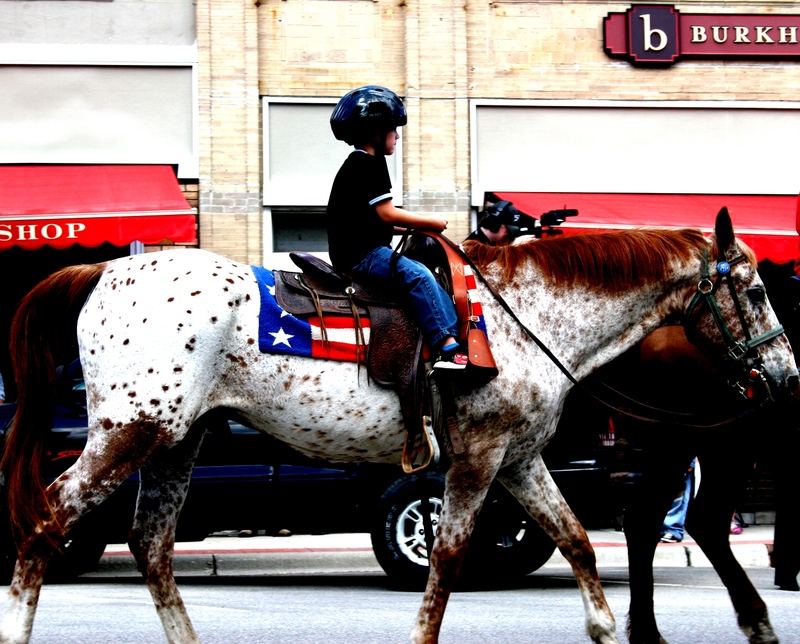 The parade, as it always does, featured military personnel and horses and old cars and marching bands and a fire truck and kids waving flags. 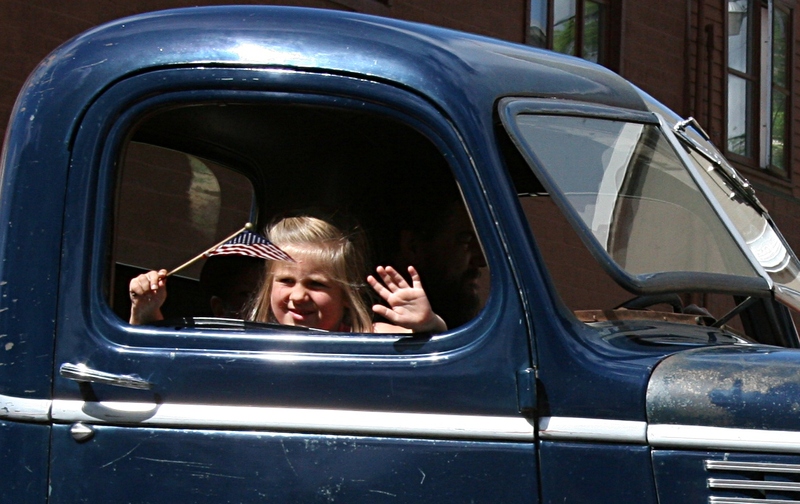 Flag-waving from an old pick-up truck during the parade. Typically we sit in the same spot on a street corner so I am assured of a wide open view to photograph the event. But this year, attempting to gain a fresh, photographic perspective on the parade, we opted for another location. Let’s just say that things did not work out too well for us at that spot. I’m going to take the high road here, though, and not go into details which would publicly embarrass an individual who already embarrassed himself by shouting across the street at my husband. He later walked across the street and apologized to both of us. We are blessed to live in a country where freedom of speech is protected. I wasn’t, of course, thinking this at the time the angry words were fired toward us. But, in retrospect, it seems the appropriate thought to have on this day when we honor those who have fought for freedom. 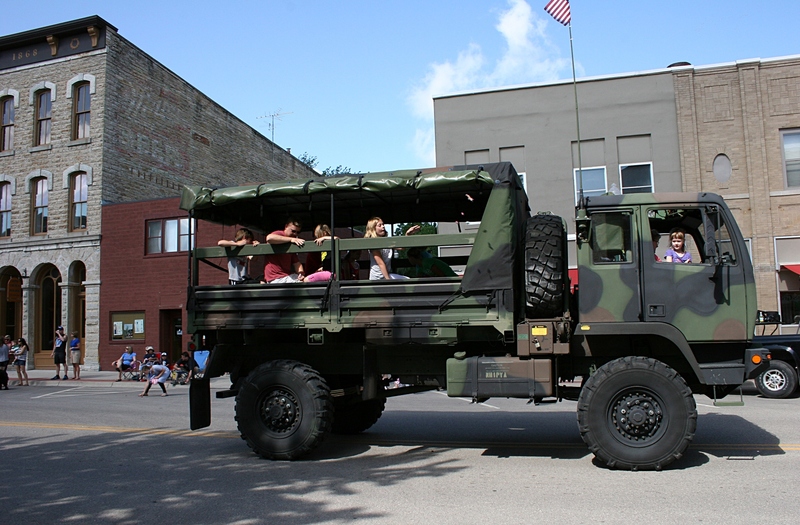 Several military vehicles were in the parade along with color guards and honored veterans. Checking out the candy scooped up during the parade. 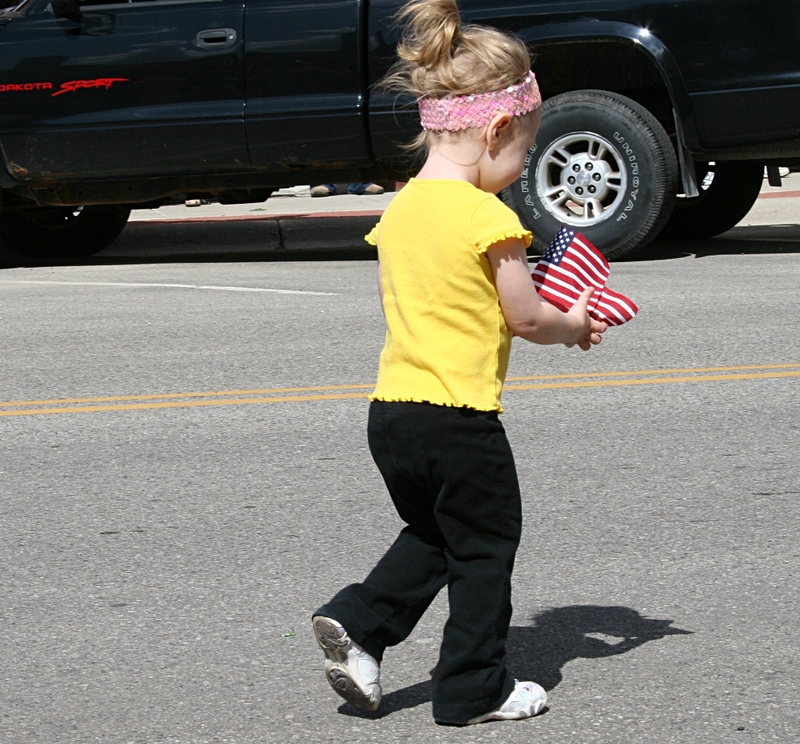 The Scouts handed out flags to parade attendees like this little girl. I upped the contrast on this image because I wanted to emphasis the beautiful blanket on that horse. THIRTY MINUTES. 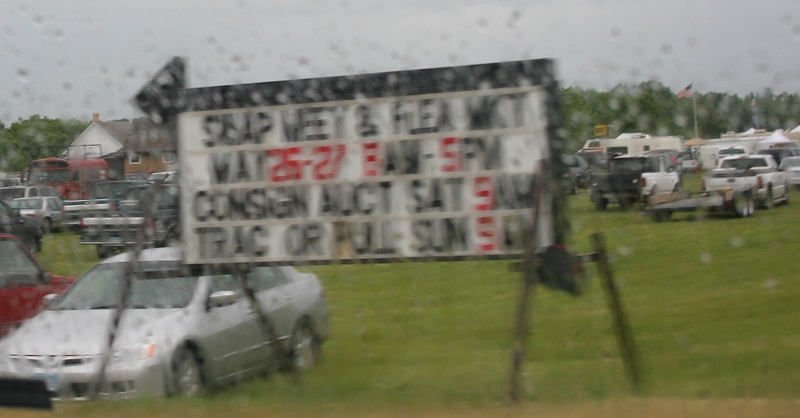 That’s all the time my husband and I had to shop at the 13th annual Rice County Steam & Gas Engines Swap Meet & Flea Market this morning before the rain rolled in. Despite the hurried pace under threatening gray skies, I managed to snap enough photos to present you with a still-life infomercial designed for your amusement, education and entertainment. 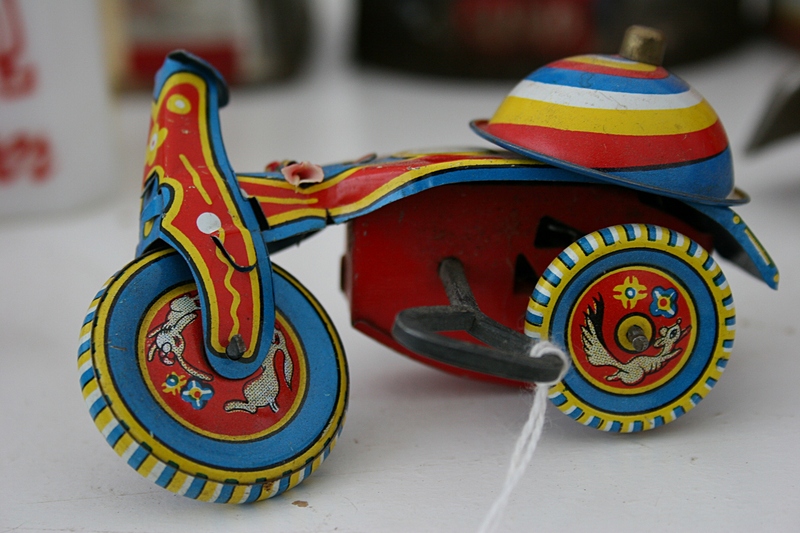 An old wind-up toy that caught my eye. 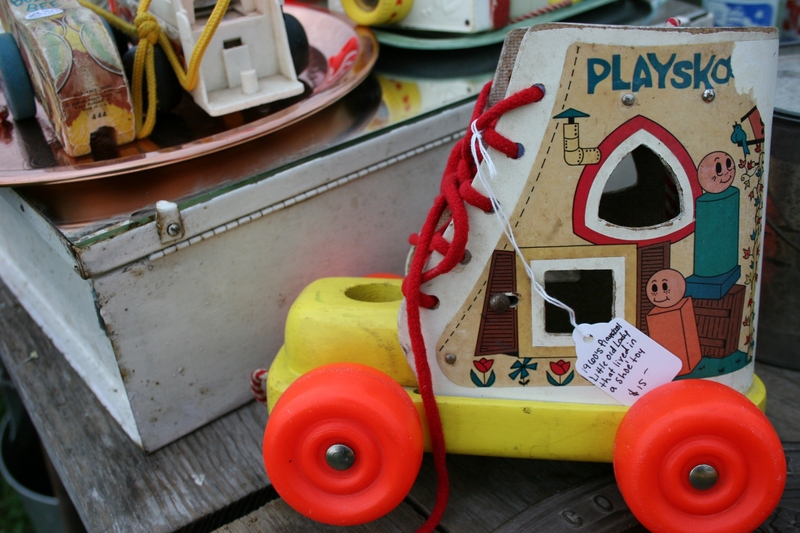 Let’s start in the TOY DEPARTMENT where vintage toys abound. The Old Woman Who Lived in a Shoe toy. 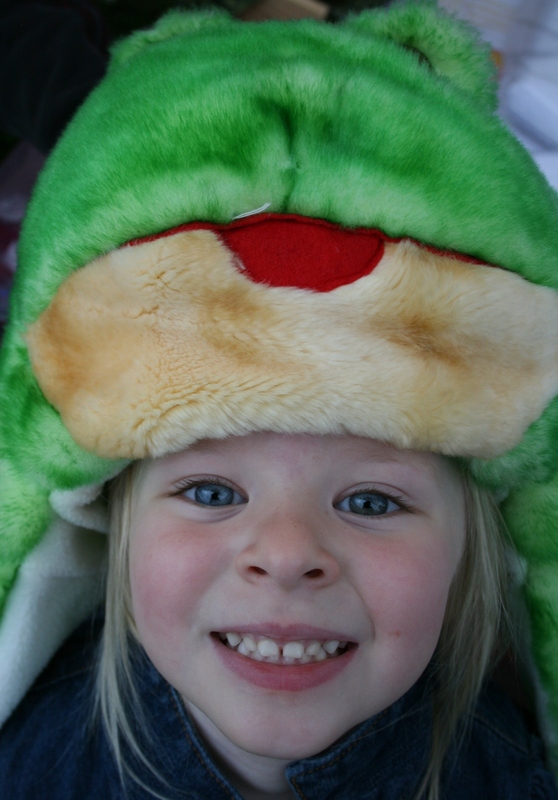 Moving on to the CHILDREN’S CLOTHING DEPARTMENT, meet model Mady modeling a fashionable frog hat purchased from a vendor. Isn’t this 5-year-old simply too cute? Now what’s that fairy tale about kissing frogs and princes and…, oh, never mind, Mady doesn’t need to hear that story yet. But I bet Howard from Farmington, over in MEN’S APPAREL could tell plenty of stories. He looks like a character. 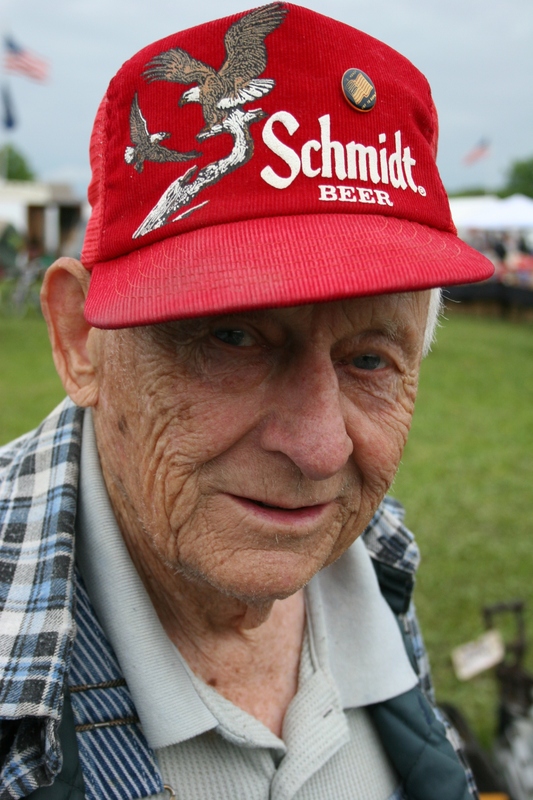 I can see it in his eyes, in the wrinkled folds of his face, in that beer cap he says garners plenty of attention. He’s a retired highway department employee, farmer, bus driver and cattle truck driver. And he once worked at a creamery. 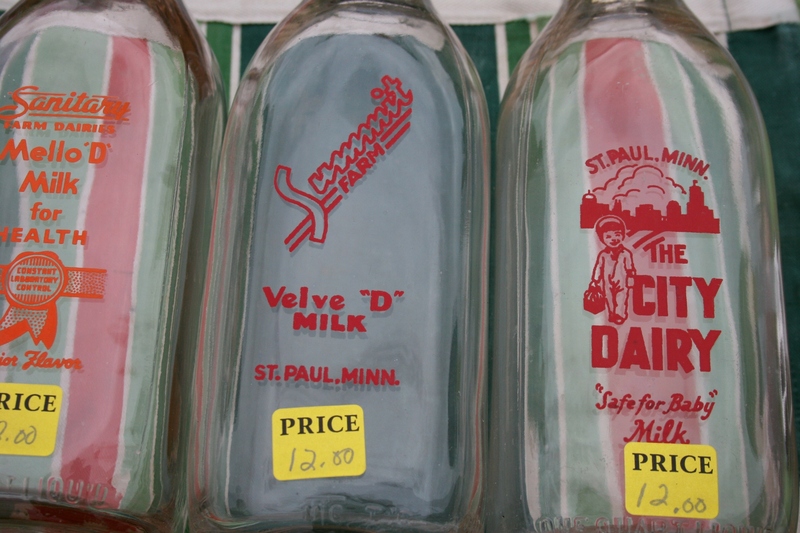 That’s a good lead-in to the DAIRY DEPARTMENT, where I found these vintage milk bottles. Examine the one on the right. The City Dairy in St. Paul sold milk that was “Safe for Baby.” What a novel idea. Then slide your eyes over to the left. What is Velve “D” MILK and Mello “D” Milk for HEALTH? OK, as long as I’m asking questions, have you ever heard of Heatwole, Minnesota (red button on lower right)? Even I haven’t, and I consider myself fairly knowledgeable about Minnesota communities. It’s apparently one of those ghost towns, located several miles south of Hutchinson. That’s your geography lesson for the day. Tables and tables and tables of hardware and tools and more. 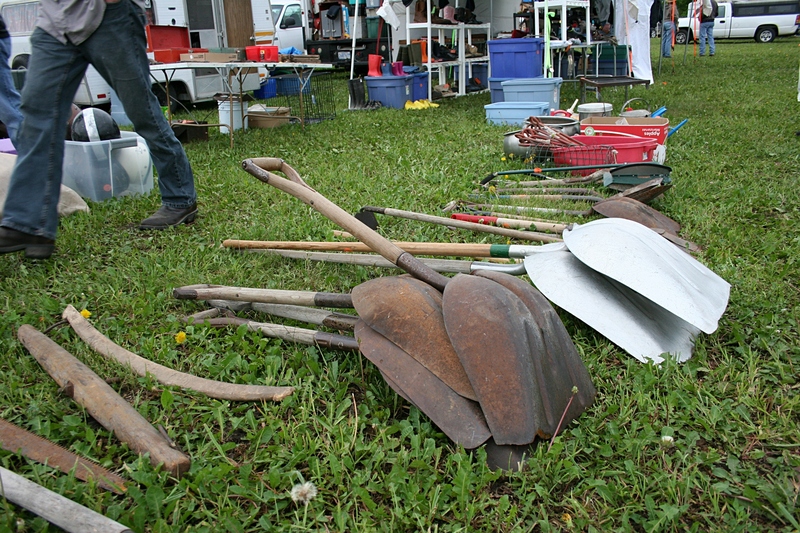 If you’re in need of tools and such, the swap meet and flea market features a massive HARDWARE SECTION. Men will most definitely savor shopping here. Enough said. 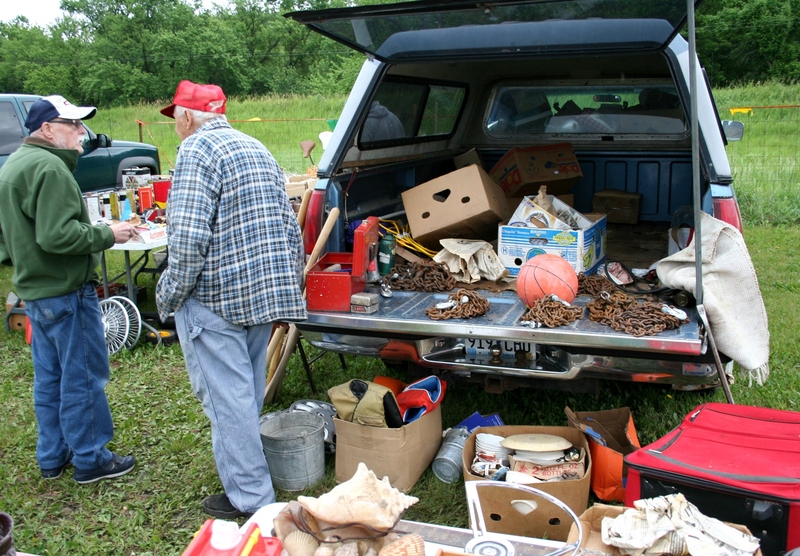 If you can’t find it on a table, Howard might have it in the back of his pick-up. 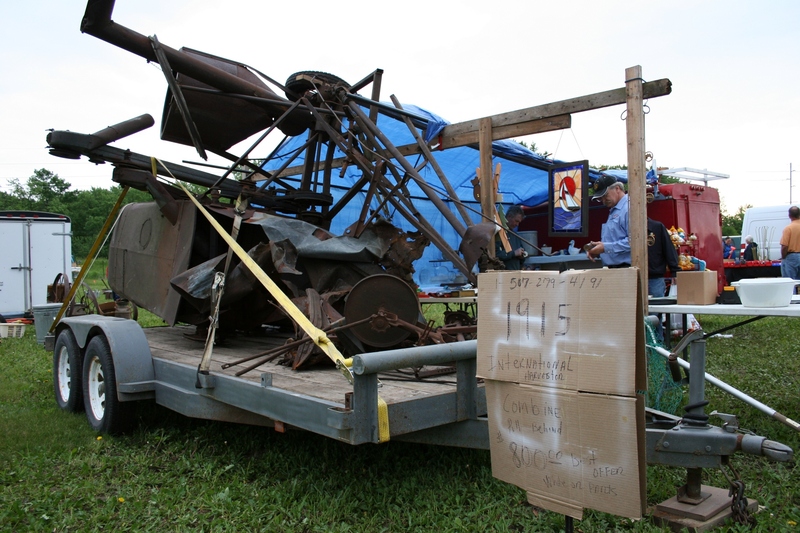 Need a 1915 combine? Yes, this would be one. Three duct tape dressed dolls on a pick-up. Strangest thing you ever saw. And, finally, as we scurried through the rain toward the car, this pick-up truck pulled into the grass parking lot. Now, what do you make of those duct tape dressed dolls lashed onto that truck? 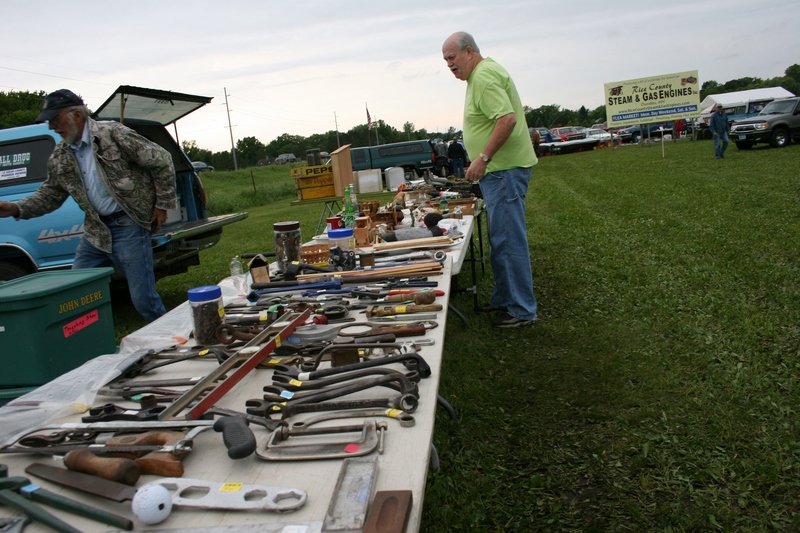 FYI: The swap meet and flea market continues from 8 a.m. – 5 p.m. Sunday at the Rice County Steam & Gas Engines grounds three miles south of Northfield on Minnesota State Highway 3. A tractor pull is set for 9 a.m. Admission is free. A pretty good deal, I’d say, for all that entertainment. WAR. It is easy to distance ourselves, to forget. Out of sight, out of mind. I’ve never lived that life in the present. But I have experienced it in the past, in the afterward of war. 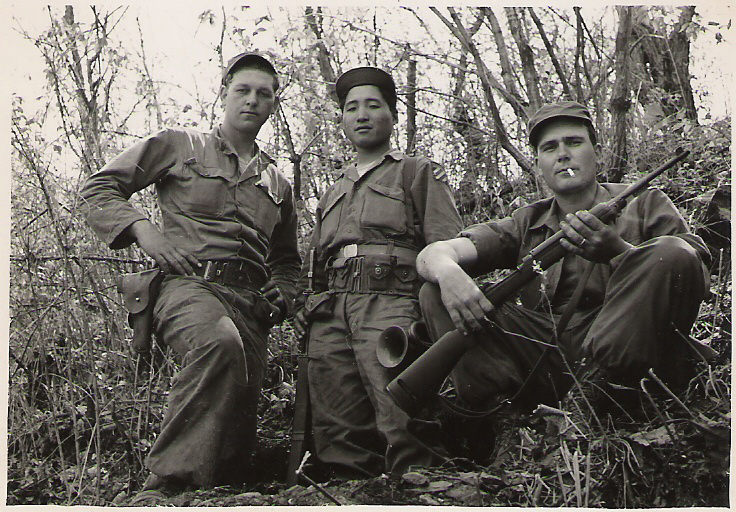 My father fought on the front line during the Korean War. Battle forever changed him. How could it not? If you killed someone close enough to see the whites of their eyes, how would you feel? Even if you understood the choice, kill or be killed? My dad lived with the demons of war—the nightmares, the flashbacks of buddies blown apart on the battlefield, the memories of hunger and cold and the digging into foxholes and a sniper picking off members of his platoon and mortar rounds winging toward him. There is no glory in war or in violent death on the battlefield. Sonny Nealon, Ray’s best friend in high school, sent me this photo he took of his friend Ray’s gravestone. 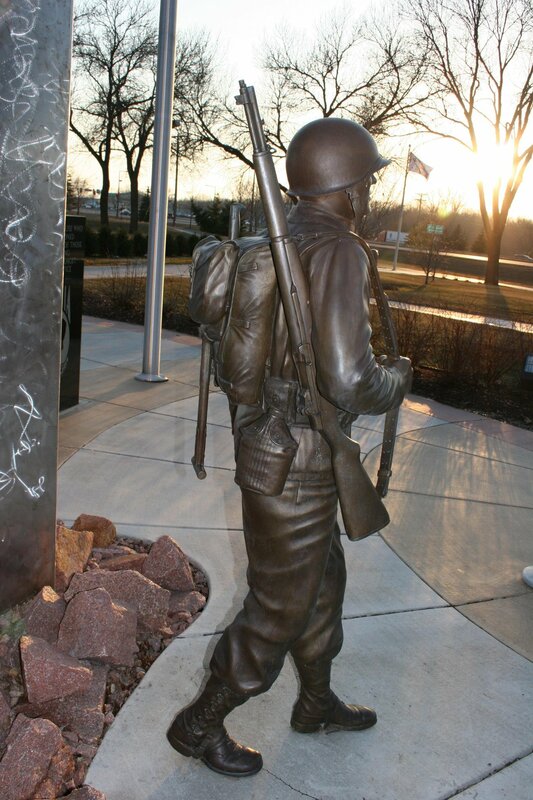 Ray was killed by a mortar round on June 2, 1953, the day before he was to leave Korea and return home to his wife and six-week-old daughter in Wollbach, Nebraska. My dad witnessed his buddy’s death. Honor them. Respect them. Thank them for giving of themselves to preserve and protect our freedom. Long-time Cannon City resident Bob respectfully removes his cowboy hat during the playing of taps at the 2011 Memorial Day service at the Cannon City Cemetery. 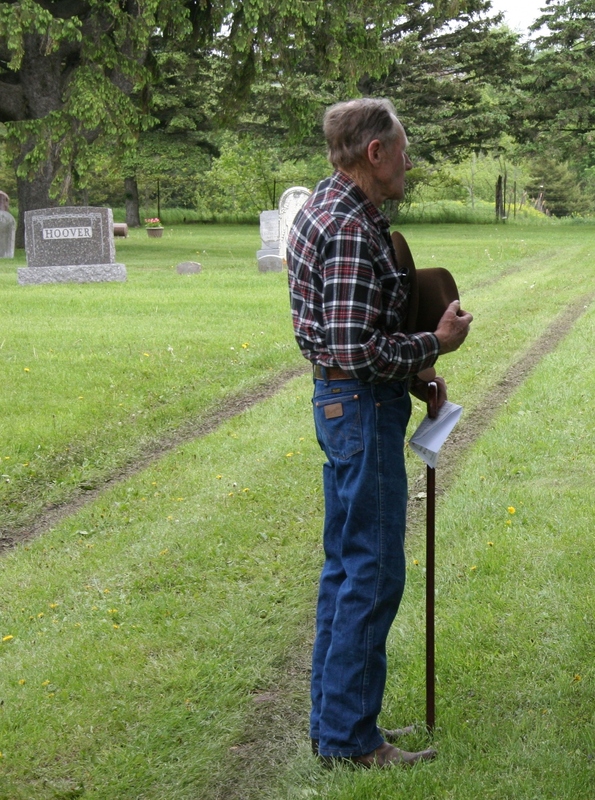 If you want to experience a simple and moving program in a rural cemetery, attend this one at 2 p.m. Monday at Cannon City (near Faribault). 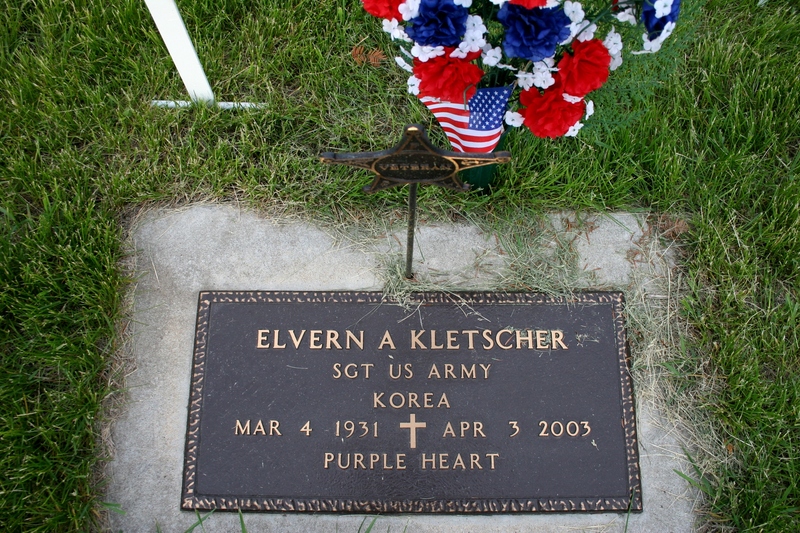 An in-ground marker honors my father, Elvern Kletscher, a Korean War veteran and recipient of the Purple Heart, for wounds he suffered at Heartbreak Ridge in Korea. 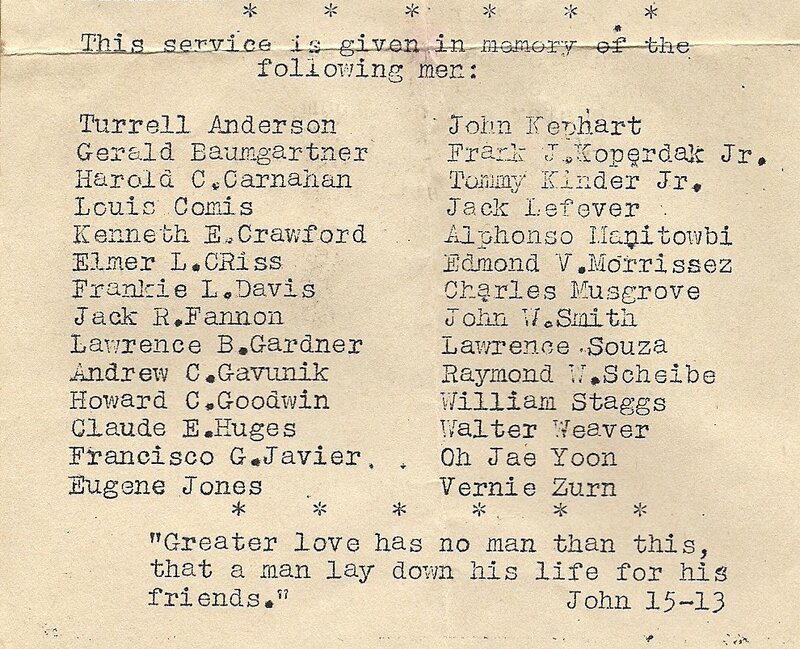 And if they are no longer living, like my dad, honor them by visiting their grave sites or a veterans’ memorial or by attending a Memorial Day service or parade. That is the very least we can do to express our gratitude. 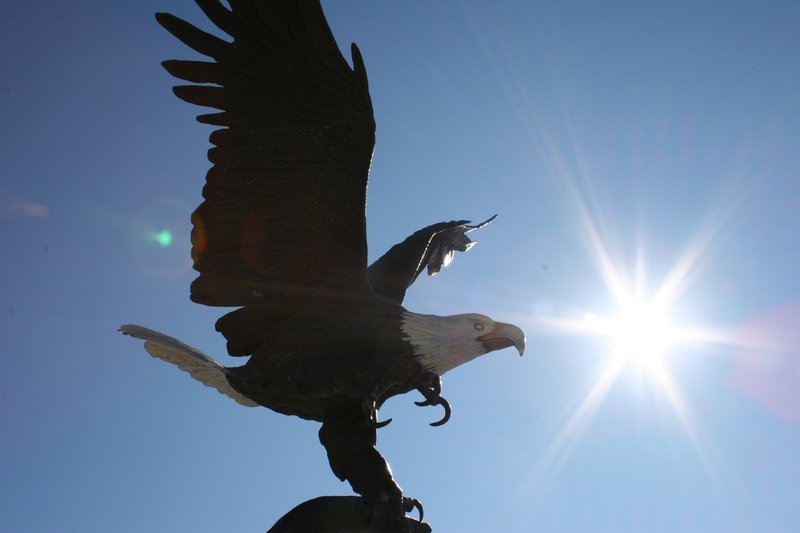 An eagle at the new Veterans Memorial Park in Morristown. The memorial will be dedicated at 3 p.m. Saturday. 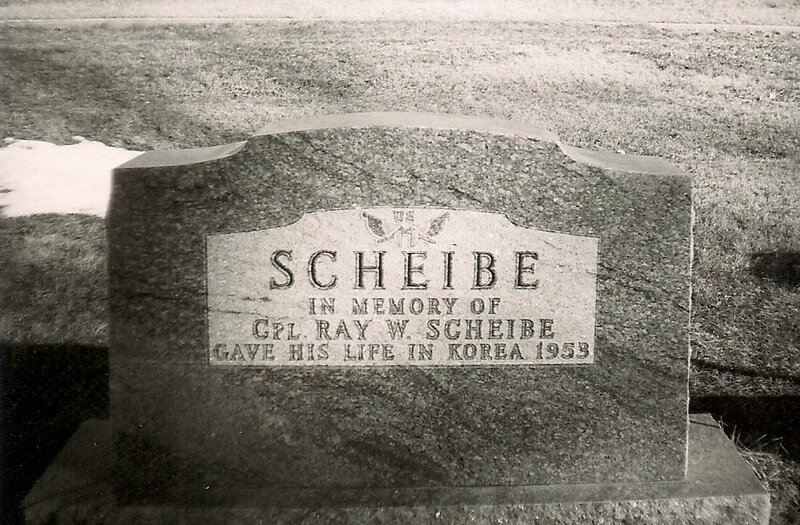 TO READ A STORY I wrote about my Dad’s service in Korea, click here. The story was published by Harvest House Publishers in 2005 in the book, God Answers Prayers: Military Edition, edited by Allison Bottke. 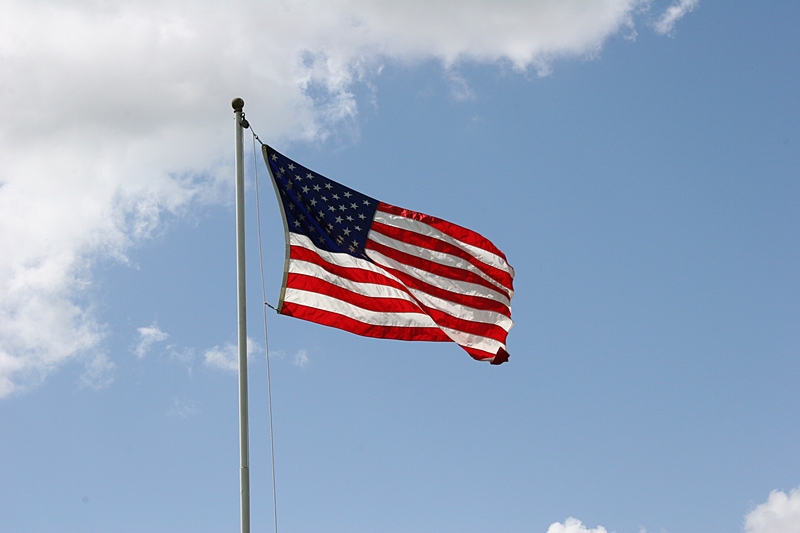 HOW WILL YOU HONOR veterans this Memorial Day? 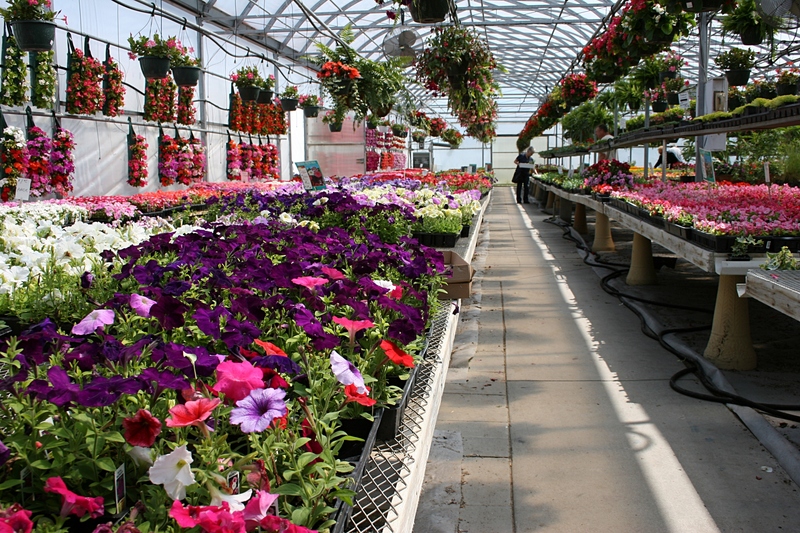 Tables packed with colorful flowers fill the Faribault Garden Center. HOT PINK, royal purple, bold orange, golden yellow, pale peach…seemingly every imaginable hue blankets the greenhouse in a riotous patchwork quilt of blossoms. I stand there. Blissful. Smiling. Taking it all in. How can I possibly choose where to aim my camera first, which blossom to dip my nose into, which plant to admire? 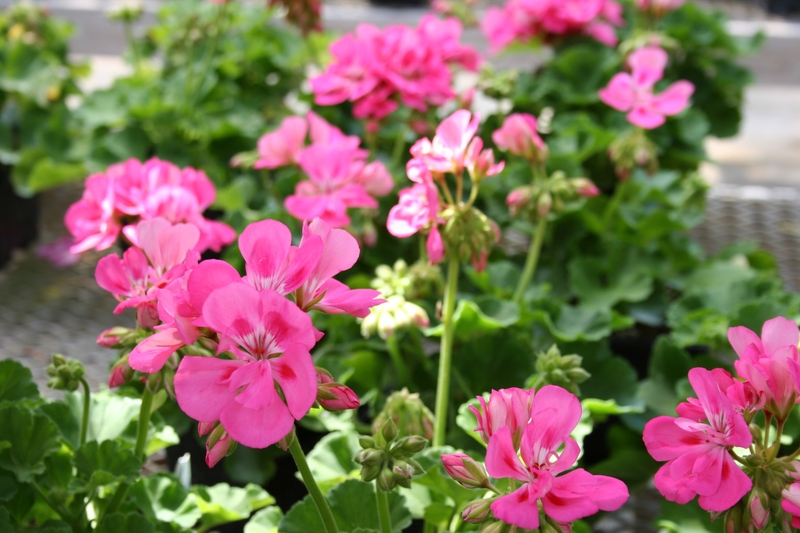 Hot pink geraniums initially catch my eye. 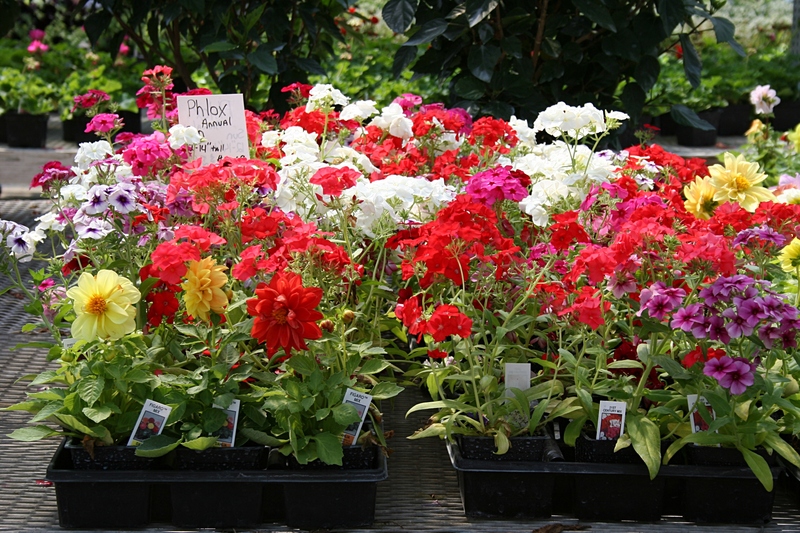 It is impossible not to be happy in a place like this, to want to swoop up the old standby geraniums and petunias, to grab packets of dainty, sweet-smelling alyssum, to corral containers of impatiens onto a cart, to choose the crimson bloodroot plant, to want it all, to fill my yard with color and beauty. 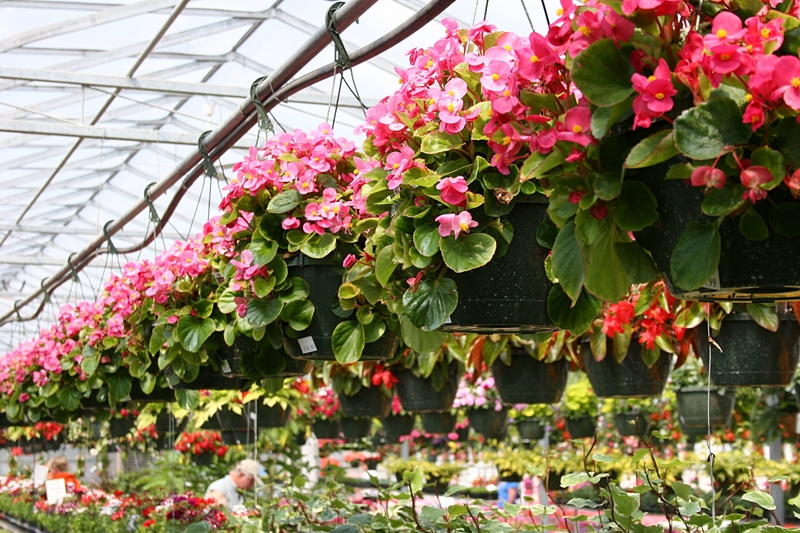 A row of hanging baskets filled with begonias stretches across the greenhouse. A Minnesota winter, albeit a mild one this year, does this to me. Not even the vibrant and bold polyester patchwork quilt that warms me from November to April is enough to satisfy my visual need for color. By May, my soul, my eyes, my very being yearns for nature to color my world. 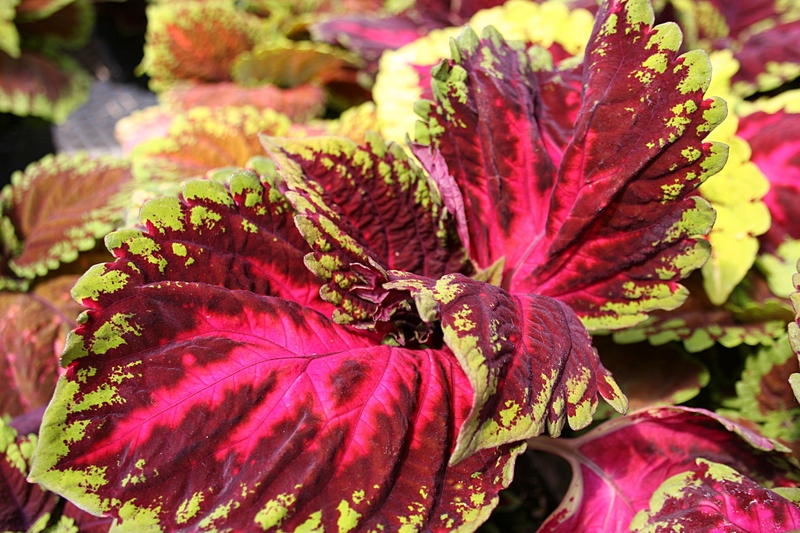 A colorful King Kong coleus. 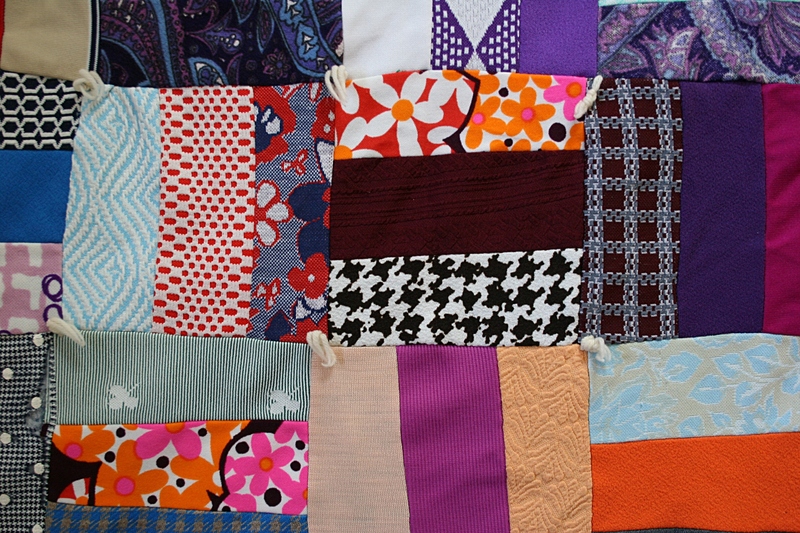 A snippet of the vibrant polyester patchwork quilt my paternal grandmother stitched for me so many seasons ago. 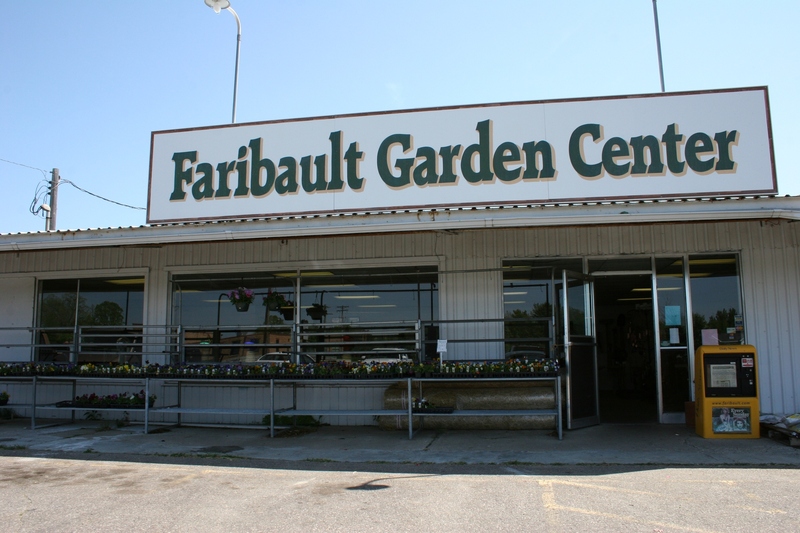 The non-descript Faribault Garden Center, where I photographed all of these flowers.